The holiday weekend features were all stacked on the two days before the Fourth of July, so we can cover what happened here on Independence Day in America. Our Canadian neighbors celebrated the birthday of their country—144 years—on Friday, July 1. These two harness-heavy theaters were busy with racing action. Our success surfaced at Tioga, where our two choice for the $76,200 Ladyship Stakes combined the hard way for a $26.80 exacta. On top was Rocklamation, paying $14.40, while Honky Tonk Woman, the public choice, was second. One of our North America Cup choices, Powerful Mist, won at the Meadowlands in an Open and paid $7.80. Fashion Delight showed up in the race and was the favorite. The former frosh champ was disappointing. He needs a major win soon to keep abreast with the powerful glamour-boy pacing crop aiming for the $1-million Meadowlands Cup this month. 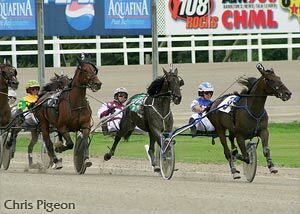 For more success, you have to check out our Hambletonian-eligibles results. We forecasted the victory of Charlie De Vie over the monstrous choice Manofmanymissions and we were right. “Charlie” did not break and “Man” got a bad start and jumped. Charlie paid $6.80, not bad, for his chances were far better than his odds. The last month’s action for the glamour-boy-and-girl trotters before the critical finals the first Saturday in August is available at our exclusive Hambletonian Trail blog. Follow the analysis’s there and the reviews, results and archives at the Hambletonian Society home page. No one could beat Arch Madness in the Titan Cup. He was magnificent, setting a speed record and leaving a landing strip worth of ground between his strong square steps and the second horse in the field. The $500,000 Ben Franklin at Chester was a very strange race. We Will See was the favorite and he won, beating a choice field that included Bettor Sweet, Foiled Again, Won The West and other FFA pacers. I say strange because there is no odds line I could have imagined writing that would have made “See” near 3-1. Sometimes the public is far sharper than I estimate. A score of frosh races, most in the form of sires stakes, took place over the weekend. The group presented some mighty strong youngsters on both gaits. Rocknroll Hanover products for 2011 are in demand and producing already. They battle against one another and finish to form exactas and make noise in trifectas. Few are fooling the public right now, either. Follow me on Twitter for racing news, updates and last-minute picks on the weekends. Jack Moiseyev (pictured, right) was injured in a race at Mohawk over the weekend and was brought to the hospital. Jack is reportedly back home recuperating. We do, however, sadly document that one of the pacers in the accident died as a result of the mishap. The pacer, No Flash In Pan, was killed. This is very rare, as standardbreds are strong and sturdy horses by comparison to other racing breeds and death is rarely the result of an accident. Pompano Park Harness’s leading driver for its 47-year history has returned to the track after a race accident sidelined him three months ago. Bruce Ranger flexed his muscles in a qualifier, his first trip sitting in the bike since mid-April. Soon you will see him listed to drive and I would watch for some of those drives that offer better odds than usually given to Ranger-reined nags. He may come back with a vengeance at first, making a difference in some public-ignored entries. 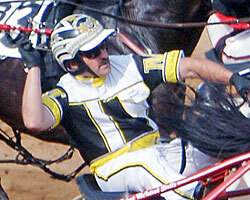 John Campbell continues to recuperate from his dastardly accident at Chester last month. There are already rumors about John retiring after this recuperation but nothing has been confirmed. We will try to find out what we can about John’s condition and his future plans. Politics and harness racing are clashing in another U.S. state this week. As with the New Jersey harangue between the Meadowlands and Gov. Chris Christie, Minnesota Gov. Mark Dayton is caught in a crisis affecting Running Aces Harness Park. A budget impasse caused Running Aces to cancel the holiday weekend programs. Racing Director Gregg Keidel received commitments from all horsemen at the current meet, saying they will stay in Minnesota through Friday (July 8), hoping for a state- budget resolution to allow the track to reopen. Over 300 horses have been idled by the shutdown and over 600 Running Aces employees were laid off. The the track is losing over $100,000 per day in revenues.